In my Why I Waited Two Years to Monetize My Blog post, I reveled that I was worried about selling out in order to make a quick buck and how I finally got over that to start generating an income. Earlier this year, when I read How to Blog for Profit without Selling Your Soul*by Ruth Soukup, I managed to improve my blog tenfold. Ruth’s book was one of the main driving factors behind how I got over the fear of monetization and how I have been able to grow my blog and platform. I highly recommend that you read it as it will provide amazing tips and insight on how to start generating an income from your blog. The next greatest thing that Ruth provided me with to help me grow my blog was Elite Blog Academy *. If you have not taken her course yet – do it, it’s amazing. 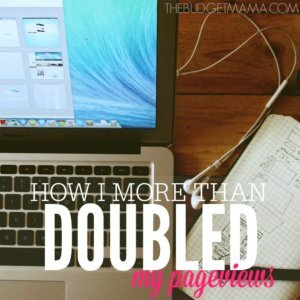 Even though this list is definitely not exhaustive of the things you can do to increase your pageviews, I truly believe it will help you see an increase. Content is King – it truly is and if you do not have great content, you will struggle to keep readers on your site. Make sure you are passionate about what you are writing, because if you are not passionate it will show through your writing. People love authenticity; make sure you are always putting out authentic content that draws people in. If you are struggling for ideas of what to write, look at the categories you have on your blog and then brainstorm five posts around each of those topics. The more amazing content you have on your site the better. My 31 Days of Real Life on a Budget series drew a ton of new readers in. You could write a blog series around your most popular blog topic in order to have more content to share and promote. You do not have to write for 31 days (although I think it is an amazing challenge); you could do a 21 days series or even just a “parts” series with four or five posts around a topic. Once you have your amazing content finished, make sure you promote the crud out of it. Pinterest is by far my highest source of traffic, followed by Facebook. Make sure that you always have a “pin-worthy” photo on every post. The optimal size for Pinterest is 1000×1500 and the optimal size for when sharing your link on Facebook is 1200×627 (the photo that appears when you insert the link into your Facebook post). I use free sites, Pixabay.com and PicMonkey.com for my stock photos and to edit. Make sure you rock your images in order to draw people in. ***Another tidbit on Pinterest – add a description to your Pin, do not just restate the title. You want to make people want to read your post right now. Along with promoting your site via social media, you should promote your site through guest posting. Each time I guest post, I not only receive a great surge in traffic, but I also gain dozens new followers and subscribers. Make sure you only submit your best content and you follow the blogger’s instructions on what they expect from a guest post on their site. If you are still on Blogger, you may want to consider making the switch to WordPress. WordPress has a more “professional” feel to it and typically, ad networks like AdSense will pay more to advertise on a self-hosted site. This was one of the best things I have done for my blog. Another tool you will want to use is Peek Review to have a stranger view your site. It is scary to hear what others have to say about your site but it is extremely important to have a site that is easy to navigate and is appealing to others. Peek Review is free and you can have your site reviewed up to three times a month. I have yet to have my site professionally designed (on my 2015 goals list), but you need to have an appealing site even if your budget does not allow for a professional to design it. There are dozens of premade templates out that you can choose from and then customize to make your own. My current design is the Delightful Theme from Restored 316 Designs*, which I have customized to stand out a little bit more. What do you blog about? Are you all over the place without a real plan? If so, it will be difficult to keep readers engaged, I learned this early on in my blogging career. Readers need to know what they can continually expect from your site and if you are all over the board all the time, it will be very difficult to keep your audience. Narrow down your categories and subcategories to give your blog more structure. It was difficult for me to determine my categories but once I looked at my posts that drove the most traffic, I was able to figure out topics I should write about and what ones I should avoid. These are all things that I have implemented to help me increase my pageviews but this list is definitely not exhaustive. Blogging is not for the faint of heart and will take serious hustle on your part but you can make money doing this. What ways have you been able to increase your pageviews or improve your blog? That is awesome! I really want to do the Elite Blogging Academy and am hoping I can save enough to do it in the spring. My site traffic is growing, slow and steady, but I would love to see a big jump! Great post! I love and hate Peek. I’m always so nervous to see what people have to say – but it is VERY helpful. Love how you’ve customized the Delightful theme! 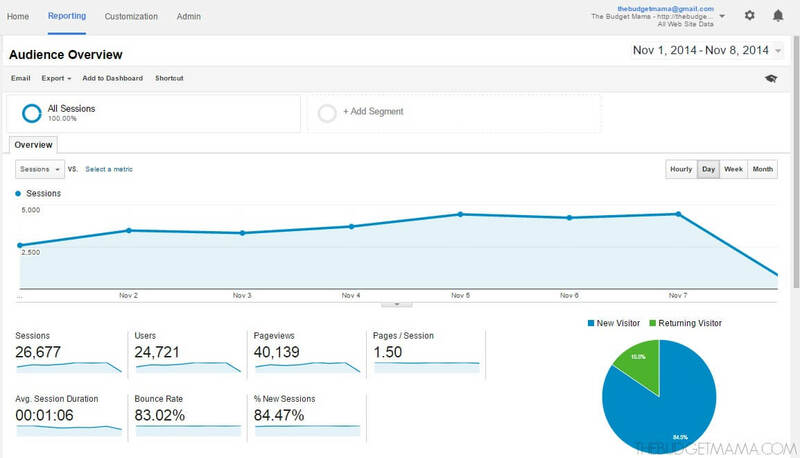 That’s an extremely impressive amount of visitors and pageviews. Nice work and congratulations! I can’t agree more that writing thought-provoking content is the way to engage your readers and keep them coming back for more. Wow, you’re doing an amazing job! 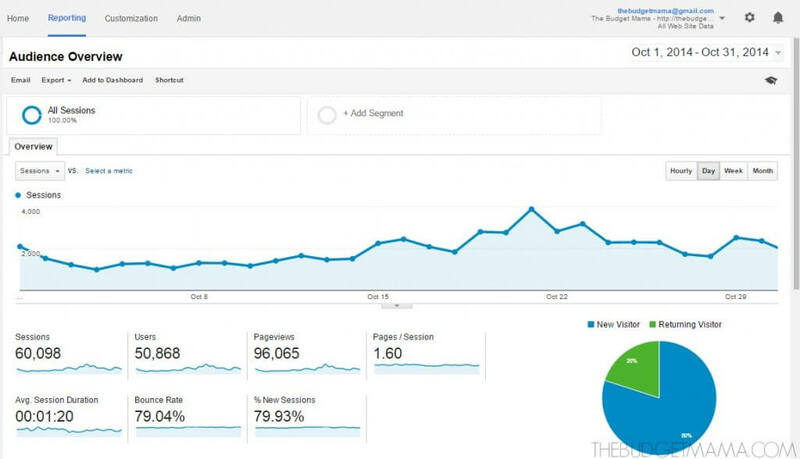 We’re only 6 months into our current blog, but our numbers are so low! 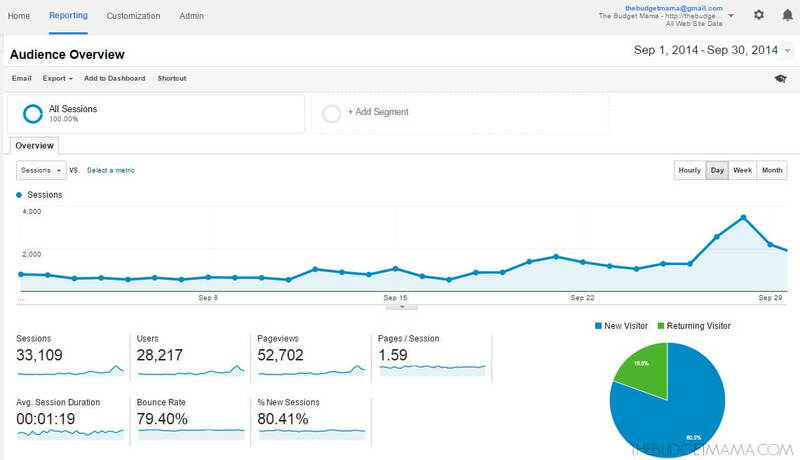 Less than 10,000 visitors per month. We have a podcast with a lot of loyal listeners, and our audience is really engaged and we get to know them well, but still, I know we need to be hustling more on Pinterest to drive more traffic our way. Question for you – how much time do you spend on Pinterest each day adding all your best content to group boards? I’d like to commit myself to a given number there, but not sure what is realistic. Or do you use a scheduling program? Thank you Beth for your kind words! 🙂 I manually pin all pins, three times a day. Typically those times are (all ET), 9am, 2pm, and 9pm. I use a spreadsheet to track where I am pinning so I do not repin too many times the same pin to the same board in the same day. I spend about thirty minutes pinning and pin about 25 pins each time. Hi Jessi! Loving your blog! Do you pin other people’s pins or just from your blog? You have awesome traffic! Congrats! I had not heard of Peek Review so have just submitted my blog- feel a bit sick! I have nowhere near the numbers you are talking about but then my blog is just a mummy blog so I guess it is never going to compete with craft bloggers etc..
What nice pieces of information you have here regarding growing your blog and monetizing it. I wanted to follow you but only saw the button for subscribing to a newsletter. How do I follow you? Have a great and successful year. You can follow me via the buttons at the top of the page or on the ones towards the bottom of the side bar. 🙂 Thank you so much for your support! Oooh! Ouch! Just had a Peek review. I see what you mean about love/hate. Thanks for the great tips though. Oh yes! Peek scares the crud out of me but is super helpful in figuring out changes I need to make. This is great advice. Thank you! I’m working my way through EBA – it’s great isn’t it! I’ve just now ordered Ruth’s book and a Peek test so I’m keen to see what comes of both. So much to learn!!! Thank you for your post! As a new blogger reading tips and tricks on how to make my blog better is always so rewarding. Thank you for your insight and direction! Awesome traffic and you deserve every bit of it! I still pin other people’s content but the 25 pins are my own as that is what I track. There is a max number of repins…I think it’s 200,000 but I could be wrong. I can honestly say I do each of these things, and my blog is growing. What I need to figure out, though, is how to monetize more effectively. I’m pretty sure I’m not making anywhere near what I should for the views that I have. That’s on my to-do list for after baby arrives and things settle back down! 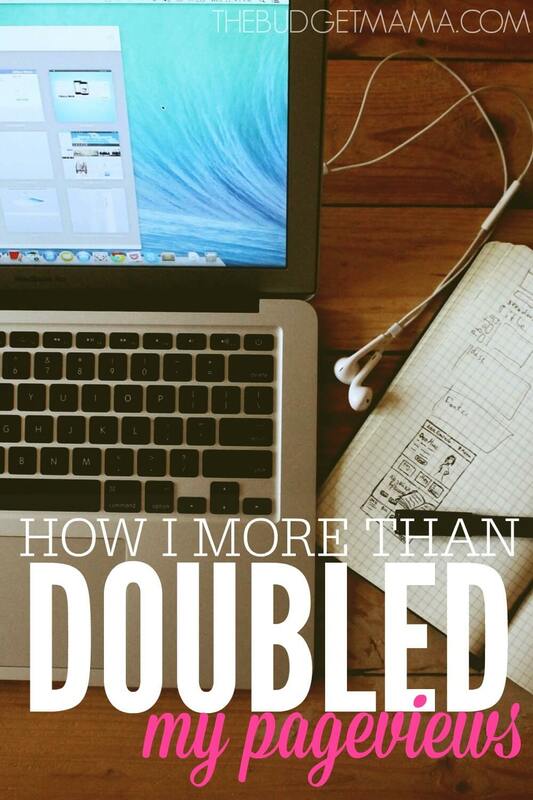 I just started writing my blog like…a week ago ha! This post was super helpful! I love the idea of narrowing down some categories because my brain is all over the place right now. Thank you! I’m off to categorize! Remembering to have consistent posts and subjects is so important! I neglected that for a while and now that I have a focus, I feel like things are a lot easier. I find coming up with ideas for posts and making sure I have a schedule are much easier than they used to be now that I have a specific focus. Found this post on pinterest and glad I did! So many useful tips here. I’m trying my hand at blogging again and will start to implement your tips! My focus has been content, so now that I have a decent number of posts and lots more in the draft stage, I think it’s time to promote! Thanks for sharing this. I am a new blogger, so this was helpful to me. I just started reading Ruth Soukup’s book too. These are great tips! I really think I should start guest posting – for some reason I have back off on it. I just tried Peek Review and I can’t wait for the results! LOVE that you have a comment policy! Brilliant – and “sprinkled with grace” is perfectly put. May implement one myself. Thanks for the lovely article! Wow, Jessi, I am impressed with the dramatic change in your numbers over those two months last year! This year you must be really rockin’!! 🙂 I am re-thinking my blog over the holidays and making goals for next year, so this post is very timely for me. Thanks! Great stuff! I never thought that there was a website to check my blog for the way it runs! Great to know! I’m a huge fan of EBA as well. I just started a few months ago and can already see some major improvements in my blog and my writing. Content really is king! The rest of the stuff will work itself out if you have good content.